Condition: See Pictures. These are photographs of the actual book you will be receiving. MARVEL COMICS DAREDEVIL LOT OF 16 SILVER AGE COMICS – These comics are inPR (0.5) to VG/FN (5.0) condition. Marvel Daredevil Silver Age Lot of 16 comics. #73 G/VG 3.5 Nick Fury/Iron Man. Included in this lot are. (1st App & ORIGIN of Daredevil) Daredevil #1. Daredevil #3. "ORIGIN and 1st Appearance of The Owl!". (1st App & ORIGIN of Moon Knight) Werewolf By Night #32. (1st App & ORIGIN of Brainiac) Action Comics #242. Sub-Mariner Appearance!". (1st App & ORIGIN of Daredevil) Daredevil #1. Daredevil #7 MARVEL 1965. (1st App & ORIGIN of Moon Knight) Werewolf By Night #32. Beautiful HIGH GRADE example - with Excellent Gloss quality! 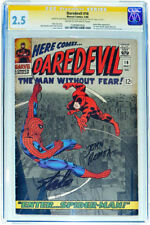 Daredevil 1 CGC 3.0 First Daredevil!. Shipped with USPS Priority Mail. "Enter.Spider-Man!". Featuring the talents of Stan Lee & John Romita. This item is a must have addition to your collection. It takes one minute to fill out the form and will ensure 100% accuracy for your order. 1976. TWO x "DAREDEVIL" Marvel comics. Vol.1. #'s 130 and 134. Good. 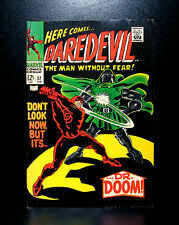 Two x "DAREDEVIL" The Man Without FearMarvel comics. Published by Marvel Comics Group in February and June 1976. Note : As my comics have been previously owned, I don't use "Mint" grading. All our comics are despatched in plastic sleeves with backing boards, within stiff card-backed envelopes for maximum protection. 99p START & NO RESERVE. Daredevil #11. A solid and tight mid grade US cents issue. The comic is complete, lies flat and is tight to both staples. Interior pages are a supple off white. The cover shows just minor general wear/stress. 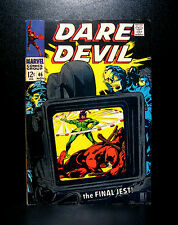 DAREDEVIL VOL #1 ISSUE #11. NO COVER STAMP. HIGH GRADE. (Daredevil Annual (Special) #3 | FN Rare Amazing Spider-Man 1972 John Romita-NR Act Fast on this one! Check out the scans to get a better idea of the condition.). Daredevil # 81 Death is a Black Widow ! 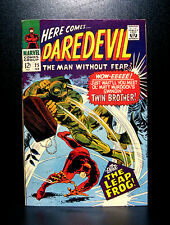 Daredevil (1964) # 10 (5.0-VGF) (401340). Mint 10 to 9.9. Thes designations are only used for the purpose of authntication. 6.5 - Fine . Incomplete 0.3 to 0.1. Heavy defacing with paints, varnishes, glues, oil, indelible markers or dyes, etc. 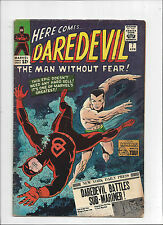 Daredevil # 158 First Frank Miller Daredevil ! grade 8.5 scarce book ! Daredevil # 158 First Frank Miller Daredevil ! Daredevil #10. FR/GD 1.5 - Cover - Creases tears and folds, May be detached and with considerable wear and staining - up to 1/10 of the back cover may be missing - one missing staple is acceptable and massive rust migration. Comic is slabbed and CGC graded 9.0 - Off-White/White pages. EC Comics " Foul Play! ". by Grant Geissman in Mint Condition. Foul Play! Plus, the book includes a special bonus: a lost E.C. Comics story "Wanted for Murder!". originally intended to be published in 1956 but forgotten and unseen until now. SPIDER-MANx-over- STAN LEE/ ROMITA. 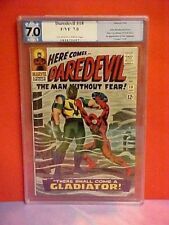 DAREDEVIL #17 1966 FN MARVEL. Daredevil # 100 Never read a story like Mindstorm ! grade 9.0 scarce book ! Daredevil # 100 Never read a story like Mindstorm ! Daredevil # 105 Meet Madame McEvil's Terrible Trio ! grade 9.0 scarce book ! Daredevil # 111 Victim of the Silver Samurai ! grade 9.0 scarce book ! Daredevil # 111 Victim of the Silver Samurai ! Daredevil Annual # 1 Electro & the Emissaries of Evil ! grade 7.5 scarce book ! Daredevil Annual # 1 Electro & the Emissaries of Evil ! 1969. 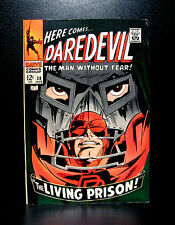 "Here Comes DAREDEVIL" Marvel Comic Vol.1 #59. The Man without Fear. VG. The Man without Fear. Published by Marvel Comics Group in December 1969. All our comics are despatched in plastic sleeves with backing boards, within stiff card-backed envelopes for maximum protection. Character appearances: FEATURE: Daredevil (Origin retold, w/ Stan Lee's original dialogue from issue #1); GUESTS: Battling Jack Murdock (flashback); Foggy Nelson (flashback); Karen Page (flashback); VILLAINS: The Fixer (flashback); Slade (flashback) --check out the pic for a great look-------------------------------------------------------- -------------------------------------------------------- ----------------------------------------------------- -. Daredevil # 52 The Night of the Panther ! grade 9.0 scarce book ! Daredevil # 52 The Night of the Panther ! DAREDEVIL #11 1965 MARVEL 'ORGANIZER UNMASKED'- -WOOD/POWELL VG . DAREDEVIL #5 (VG) Nice Color! Marvel tanning on inside cvrs deepens hue of outside cvrs (seen mostly at top edge). TYPE WHAT YOU'RE LOOKING FOR IN THE "FIND" WINDOW UP TOP. cvr retains super-nice, vibrant color! I 've been a comic collector and dealer for 40 years. Grade: VERY FINE (VFN) (8.0). We recognise that the whole area of Grading is a very subjective one, but using the guidelines, we would judge this comic to be. Daredevil #9. A nice looking higher grade US cents issue with plenty of cover gloss. The comic is complete, lies flat and is tight to both staples. Interior pages are a supple off white to white. A smart early Daredevil comic in around. SPIDER-MAN -xover, GENE COLON/STAN LEE. DAREDEVIL #27 1967 VF/NM MARVEL. We will take great care in processing your order. "In Mortal Combat with Sub-Mariner!". Written by Stan Lee. Art and cover by Wally Wood. Namor hires Franklin and Murdock to sue the human race on his behalf. Realizing humanity won't listen, the Sub-Mariner goes on a rampage which brings Daredevil into the (hopeless) fray.